Sorry for being a little slow on the news, I am actually in Australia now. Tony Quinn wins the Targa Tasmania by 6 minutes over Jason White in a Lamborghini Superleggera. 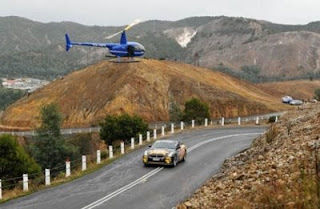 Quinn, a former Targa New Zealand winner, threw down the gauntlet on the first stage just outside Strahan, beating Weeks by 11 seconds to reclaim the lead. Weeks set off in pursuit, but he and co-driver, Bec Crunkhorn, crashed their Lamborghini Gallardo Superleggera into trees near the end of the Queenstown stage. Medical crew were quickly on the scene to assist Weeks and Crunkhorn. Both were conscious and talking to the rescuers before being airlifted to Hobart General Hospital for further medical assessment; their dream of a first Targa title in tatters. Quinn’s lead was then out to nearly four minutes and, with the Lamborghini of Jason White behind him experiencing major brake problems, he was able to cruise in to Hobart to collect the spoils of victory. “Our strategy was always to keep up with the others and if we got the wet weather over the last day or two, just to have a lunge for it,” Quinn said. “I’ve always been bridesmaid to Jim (Richards) or the Whites or somebody else, and we’re very pleased to finally win it. It hasn’t sunk in yet and it feels like it’s been the toughest and most competitive week there’s every been in Targa.